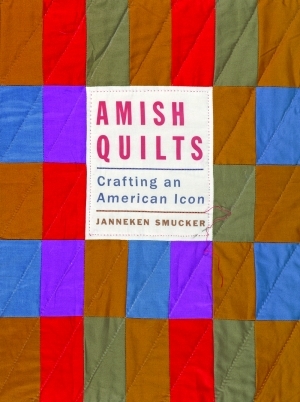 We’ve got a winner of Janneken Smucker’s Amish Quilts: Crafting an American Icon. You’ll find out who at the bottom of this post. But first, Janneken was kind enough to answer two more of your questions and share some more quilt images. Janneken Smucker: Thanks to John Leuders for asking about Hmong involvement in Amish quiltmaking. This is a topic with which I am quite familiar, and one I address and place into cultural context in Amish Quilts: Crafting an American Icon. The short answer is, yes, Hmong women with their own extraordinary needlework skills, which combine applique (including a particularly intricate form known as reverse applique) and embroidery, have been active participants in the Amish quilt industry. Many Hmong refugees relocated to North America following the Vietnam War, which spilled over into regions they inhabited in Laos. 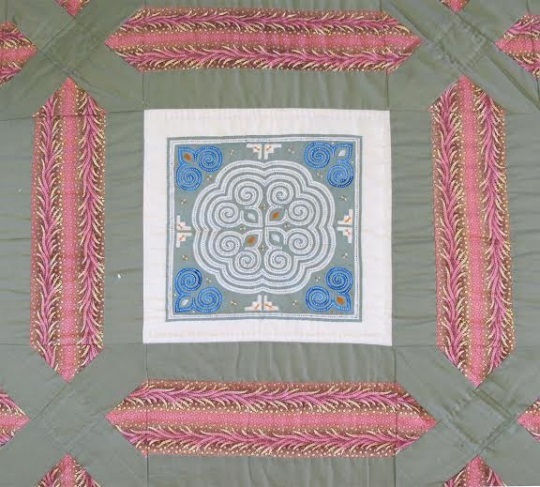 Some resettled in communities near Amish and Mennonites, including in southeastern Pennsylvania, where in the early 1980s they found work in the booming quiltmaking industry in Lancaster County. 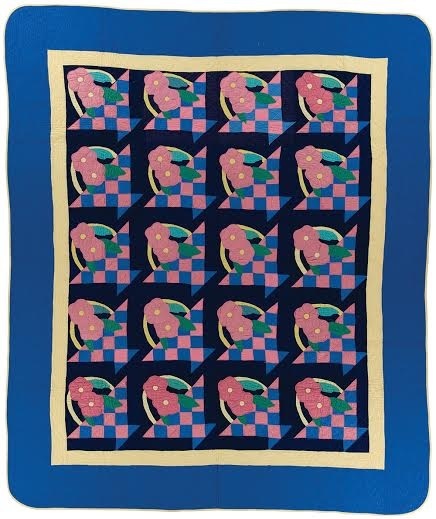 Amish and Mennonite entrepreneurs hired skilled Hmong women to do much of the applique on the new style of quilts. And unfortunately, these skilled needleworkers received little public credit, as too often quilts were marketed as “Amish made” or “locally made,” which still suggested Amish attribution to most consumers. More accurately, these quilts were collaborations, crafted with non-Amish commercially published patterns, Hmong applique, and Amish quilting. As John notes, Hmong in Wisconsin, as well as in areas near Amish settlements have submitted quilts to charitable consignment auctions (aka mud sales). Detail, “Harmony a-Hmong the Cultures” quilt, Garden Maze. Designed by Emma Witmer, 2012, using traditional Hmong applique. My personal take on this phenomenon is that both Amish and Hmong needleworkers are quite adaptive and eager to apply their skills to a lucrative purpose. Amish did not bring quiltmaking with them from Europe. They learned once settled in places like Pennsylvania, Ohio, and Indiana. And once the outside world became interested in their old bedcoverings, they began making them to sell. Basket of Flowers, unknown Amish maker, c. 1935. Ohio. The maker adapted a Mountain Mist pattern, probably acquired by purchasing a roll of batting. International Quilt Study Center and Museum, University of Nebraska-Lincoln. Today as in the past, most color choices are made at the individual level, rather than by church Ordnung. The variety of color choices—both solid and printed—is vast for both contemporary home use and for the consumer market. Quiltmakers use the colors they like and the colors that sell, as well as those that conform to what others in their individual community also like. But there are no hard and fast rules. This is part of the continuation of Amish quiltmaking shifting and changing along with others trends and fashions. The Amish have never been static or monolithic; nor have their quilts. I just used random.org to draw a winner from among the entries. Number 14 came up, which means the winner is MaryAnn Pepe. MaryAnn, send your details to me at ewesner(at)gmail.com and I will let Johns Hopkins know where to send the book. If you didn’t win, you can find Amish Quilts in a number of places. Johns Hopkins is offering 25% off if you use the promo code NAF. This is a hardcover, full-color book–great if you’re interested in Amish quilts, and great gift material for any quilt people in your life. If you use a Kindle, Nook, or other e-reader, those versions are available too, but you’ll want to access the book on a device which can display color to get the full effect–as noted earlier there are over 100 vivid images. Congrats, MaryAnn Pepe — This was a great topic and I learned alot, and will seek out Janneken’s book, soon! Thanks! Congratulations to Mary Ann Pepe. Also would like to thank Janneken for answering all our questions. I learned a lot. Congrats Mary Ann. Enjoy readin and gazing at those pictures. — Mary Ann, it shoulda been me… **grin** but congratulations anyhow! I am so happy that I won and I thank everyone! What a surprise!!! Lucky you, MaryAnn, and congratulations! And for me, another book to add to a long list of “want to read”s (guess you could call it my bucket list). Retirement is still 4 years, 10 mos. away, but who’s counting? “my want to buy” book that I keep beside my recliner. I’m not sure on which post to add this comment, but Janneken Smucker is having a Book Talk and Signing in Goshen, Indiana, and Sarasota, FL. 11 January 2014, 12:00–2:00 p.m.
13 January 2014, 10:00 a.m.
14 January 2014, 7:00–9:00 p.m.
25 January 2014, 2:00 p.m.